During its brief and rocky tenure from 1918 to 1924, pianist Gertrude Harvey Wright was one of four women in Seattle’s first black musicians’ union, the American Federation of Musicians’ Local 458. Wright, Virginia Hughes, a “Mrs. Austin,” and (Edythe) “Turnham,” all worked with their male counterparts at union headquarters and on the bandstand. After the demise of short-lived Local 458, they next joined and helped run Seattle’s follow-up segregated union, Local 493. This institution flourished from 1924 to 1958, launched a number of prominent musicians, both women and men, and helped establish Seattle’s impact and credentials on the national and international jazz scene. At that time when jazz was identified with men and particularly African American men, these female musicians helped keep jazz alive in the Pacific Northwest from the World War I era to the 1950s. As musicians and leaders, they worked within a complicated Jim Crow union system, paving the way for future female musicians. A young black man, tuba-playing Powell Barnett starts off this story. Barnett and a small group of African American men and women banded together and chartered AFM Local 458 August 9, 1918. Five years earlier in 1913 Barnett joined the white Local 76 Musicians’ Union taking advantage of its 1893 charter for “all instrumental performers.” This opportunity came when Barnett worked from 1909 to 1914 in the all-white Volunteers of America Marching Band, which brought him into the white American Federation of Musicians’ Local 76 in December of 1913. Barnett then tried to convince other black musicians to join Local 76, reasoning that “half a loaf was better than none.” However, others would not join under segregated work rules which kept black women and men underpaid in a two-tiered system, and forbade them from socializing at the union hall. Black musicians were also denied entry into the lucrative downtown, public parks, radio, hotel, and orchestral music markets. Balkanized into territory around Jackson Street, they held sway only in small clubs and speakeasies. Gertrude Wright stepped into union negotiating early, first appearing in Local 458 correspondence on February 25, 1924. She was born in Seattle in 1888. During the early 1920s, she played jazz piano in Seattle bands, as well as in other “orchestras” with 458 trombonist Robert McCurdy and 458 trumpet and sax man Frank Waldron on a small Cascade Mountain mining town circuit, which included Gold Bar in Snohomish County. Unfortunately, Seattle’s first black musicians’ union did not last. It operated haphazardly and collapsed in April 1924 due to financial improprieties. Gertrude Wright along with Robert McCurdy, Charles Adams, Leon Jackson, and S. L. Murray, wrote International officials in an unsuccessful effort to keep 458’s charter. Nine months later in December 1924, Seattle’s African American men and women formed another segregated union, the American Federation of Musicians’ Union Local 493. For more than 30 years, it successfully elected musician-leaders of both sexes, and established union-scale jobs at clubs and halls within its territory in and around Madison Avenue and Jackson Street. Statistics provide a perspective on these early female musicians. Black women were always a minority within the “colored” union. 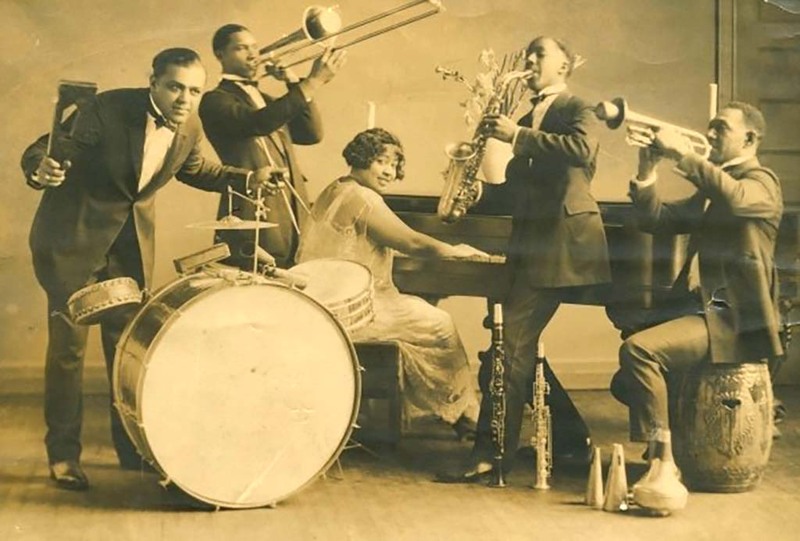 In December 1924, there were 35 black union musicians; that figure grew to 55 six months later with females making up about 10% of the membership. By 1929 piano-playing Ann Coy was a 493 musician, along with her husband, Texas bandleader Gene Coy, and their “Black Aces” band. In 1941 Evelyn Bundy Taylor became a 493 dues-payer and its first board member. In later years other female 493 unionists included: Patti Bown; Patricia Braxton; Myrtle Francoise; Grace Holden; Derniece Melody Jones; Elsie Martinez; Ruth Rhymer; Maggie Shumate; Ruth Sykes; Merceedees Walton; Gwendolyn Webb; and Ruby Bishop who in 2010 was still performing at the age of 89. Edythe Turnham sparkled during the Roaring Twenties as a pioneering female unionist, bandleader and piano player. Born Edith Payne, she came to Spokane in 1900 from Topeka, Kansas. Seven years later she married drummer Floyd Turnham, then a Spokane Club waiter. Edythe began performing with her family’s minstrel troupe in the 1910s on an Inland Empire vaudeville circuit. Edythe, Floyd, and son Floyd Jr., who became a renowned alto saxophonist, next moved from Spokane to Tacoma in 1920. Two years later they relocated to Seattle, where Edythe’s quintet performed at venues like the Copper Kettle and the Black Elks Club. Turnham was a charismatic musician who next led her own big band. Originally billed as The Knights of Syncopation, in 1928 they became the Black Hawks. As a prominent Local 493 member, Turnham and her Black Hawks hit big that year with a photo and story in Musicland, the white union’s newspaper. Her white manager, John Dallavo, booked the Black Hawks on a tour of John Considine’s Orpheum Circuit from “Winnipeg to Long Beach,” which included a week in Seattle. Evelyn Bundy followed Turnham into 493. Bundy came to prominence in the Garfield High School band, when she and drummer Leonard Gayton formed the popular Garfield Ramblers. After high school in 1926 Bundy lead the band, which became an influential fixture of the early Seattle jazz scene. Bundy was born into a musical family and studied with Seattle music patriarch and 493 stalwart Frank Waldron. She played drums, piano, saxophone, and banjo, and sang. Bundy’s band played at various venues and for black society functions. In 1929, she married Charles Taylor, who worked as a plasterer and also handled band publicity. Their son, saxophonist Charles Taylor, Jr., became a prominent Seattle band leader and later gave Quincy Jones his first 493 union job as a musician. During the 1930’s the Bundy-Taylor home became an important place for travelling musicians to socialize after their performances. Greats like Lionel Hampton, Erskine Hawkins and Lena Horne all stopped by to jam and enjoy the convivial atmosphere of their downstairs music room and bar. She also remembered harrowing experiences of 1944 USO travel playing war-torn New Guinea, the Dutch East Indies, and the Philippines. By 1945 when she landed in Seattle at the encouragement of a GI who had seen her USO show, Jones was a seasoned professional leery of the area because of her previous experience playing at the Camp Jordan “mud hole” at Fort Lawton for segregated black troops. She is also remembered as the person who brought the unknown Ray Charles to the Emerald City from Tampa, Florida. Ray Charles Robinson quickly joined 493, and his career got a boost in the clubs and speakeasies controlled by the black Local. A multi-talented performer, Jones also worked with another dynamic union woman, drummer, vocalist, and club-owner Myrtle “Myrt” Francois. Francois and Jones fronted a popular local band called “Melody and Mirth.” These two became role models for up-and-coming female musicians, like the young piano protégé, Patti Bown. During the same era, internationally acclaimed vocalist and bandleader, Ernestine Anderson, got her start in Seattle. At 18 years, she was featured in a unionized and interracial band at a May 20, 1946 “Northwest All-Star Swing Concert,” produced by KXA radio personality Norm Bobrow. Although not a 493 member, Anderson worked regularly with union musicians, including 493 saxophonist Ulysses “Jabo” Ward and trumpeter Robert Russell, by arrangement with Actors’ Equity Association, her union. This band provides a glimpse into the complexities of dual unionism in Seattle. It featured guitarist and teacher Al Turay, a self-described “Big Swede” and lifetime member of the white union, who loved to jam at after-hours sessions in Jackson Street clubs. The other Caucasian was Anderson’s bassist Bill Rinaldi, who in 1937 was the first white musician to join the otherwise all African American union. In contrast to other segregated unions such as those in Los Angeles and Chicago which were exclusively African American, other whites along with Hispanic and Hawaiian surnamed musicians joined Local 493. In 1949 Bown received a music scholarship to attend Seattle University. She also studied at Cornish School of Fine Arts and the University of Washington. In 1952 she performed with the Seattle Symphony and had dreams of working with her sister Edith (who went on to marry jazz arranger Jerry Valentine,) as a piano duo. At 22 she was a full-fledged member of Seattle’s black musicians’ union, joining officially on December 27, 1953. When Bown joined 493 it was headquartered at the “Blue Note,” at 1319 East Jefferson Street. This clubhouse-style local, complete with bar and dance floor, became the go-to, after hours, spot for fabled jam sessions. Here locals like Bown could learn their craft, trading riffs with touring greats like trumpeter Thad Jones from the Count Basie band. In a fascinating arrangement, the Blue Note was both an administrative union hall for what Floyd Standifer termed a “rainbow coalition” membership, and a cultural center for bebop music. Departing for New York in the mid-1950’s, Bown remained a union musician, and in Gotham, became a member of that city’s never-segregated Local 802. After scuffling in the Big Apple, the hard-swinging pianist eventually performed with Quincy Jones, Gene Ammons, and Dinah Washington among others. In 1959 Columbia Records released, “Patti Bown Plays Big Piano,” and that same year she toured Europe along with fellow Seattleites Buddy Catlett and Floyd Standifer with Quincy Jones’s all-star “Birth of A Band” unit. Changing times though hit Seattle’s unionized jazz musicians. The mid-1950’s would be the end of what had been a way of life for more than three decades. Local 493 women Ruth Sykes and Ruth Rhymer, along with Powell Barnett negotiated from 1954 to 1956 with white Local 76, when the unions merged. Despite both sides’ favorable votes in December 1956, a final amalgamation with Local 76 did not occur until January 14, 1958. This took place after a committee settled the African American union’s financial concerns, and sold the building and lot of the “Blue Note,” 493’s beloved clubhouse headquarters. Many promises were made about better conditions, but after 1958’s formal amalgamation, economic payoffs eluded black musicians. Yet from 1918 through 1958 a small group of determined union women performed shoulder-to-shoulder with their male partners and helped influence the growth of jazz in the region, across the nation, and around the world. Jacqueline E.A. Lawson, Let’s Take A Walk! A Tour of Seattle’s Central Area, As It Was Then 1920s and 1930s (Seattle: 1997. ); Quintard Taylor, The Forging of a Black Community Seattle’s Central District from 1870 through the Civil Rights Era (Seattle: University of Washington Press, 1994. ); Paul de Barros, Jackson Street After Hours (Seattle: Sasquatch Books, 1993); Esther Hall Mumford, Calabash A Guide to the History, Culture and Art of African Americans in Seattle and King County Washington (Seattle: Ananse Press, 1993). King County Washington (Seattle: Ananse Press, 1993). ©2019 BlackPast. All Rights Reserved.